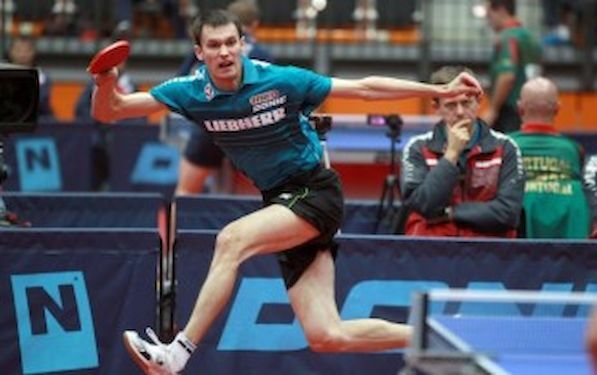 In Men’s Singles at the LIEBHERR European Championships in Austria first big casualty was Croatia’s Andrej GACINA. Worlds no. 35 suffered by the hands of Tomas KONECNY of Czech Republic, currently ranked at the position no. 159 in the World. GACINA started good, won opening game, but then next three went on KONECNY’s account. GACINA managed to recover and leveled the match before took the lead 5:1 in the decisive game. “It was strange match. I can not explain what happened, but I fought for each point and at the end I won,” said KONECNY, who lost his next round duel against Quentin ROBINOT of France. Top seed Dimitrij OVTCHAROV of Germany is safely through to the Round of 16, followed by Pavel PLATONOV of Belarus. After PLATONOV beat Alexey SMIRNOV, no. 10 seed he succeeded against Simon GAUZY of France. Alexander SHIBAEV of Russia overcame Bojan TOKIC of Slovenia in the never-ending line of upsets. Followed the success in the first round and victory over Marcos FREITAS of Portugal, Lei KOU of Ukraine, suffered by the hands of Ruwen FILUS of Germany. Stefan FEGERL of Austria eliminated no. 5 seed Adrian CRISAN of Romania. During the match of the first round in Men’s Doubles Event Mattias KARLSSON of Sweden broke the bone in his foot. Kristian and Mattias KARLSSON were no. two seeds but Mihai BOBOCICA and Niagol STOYANOV of Italy progressed further after Swede suffered from the injury. He was rushed into the hospital and doctors immobilized his leg with plaster. However Italians did not stay for long in the game. TAN Ruiwu of Croatia and WANG Zeng YI restored the order. But there were more upsets in other games. Marko JEVTOVIC and Zolt PETE progressed to the quarters. They accounted at Patrick BAUM and Bastian STEGER of Germany in straight games. Next in line of upsets was the defeat of Alexandar SHIBAEV and Kirill SKACHKOV of Russia. LI Ahmet and WANG Bora of Turkey will play for medal tomorrow. It was definitely bad day for Sweden in Doubles. Par GERELL and Jens LUNDQVIST lost against HE Zhi Wen and Carlos MACHADO of Spain.